“Use it or lose it!” Those powerful words from State Board of Equalization Member Fiona Ma, at a press conference held at MEDA yesterday, underscored the importance of getting out the message about the state’s new Earned Income Tax Credit (EITC). Ma fears that if not enough Californians take advantage of this credit, politicians in Sacramento may not fund the program again. California’s EITC supplements the federal EITC, but far too many low-income and working-class families are unaware this new credit now exists – and may be missing out on as much as $2,653 added to their 2015 tax refund. A grouping of local and state elected officials were accompanied by nonprofits United Way of the Bay Area and MEDA at yesterday’s event. MEDA is the lead agency of the Mission Promise Neighborhood. Executive Director Luis Granados first welcomed everyone to Plaza Adelante, the main venue for a quartet of MEDA VITA sites that now comprise the largest free tax preparation program in San Francisco. Last tax season, 4,000 tax returns were prepared for free, with $4.5 million returned to the community. The demand for free tax preparation remains equally strong this year. As an example of the above, MEDA client Karina Acevedo (photo, fourth from left), a resident of the Mission Promise Neighborhood footprint, was on hand to share her experience. Karina first came to MEDA in 2013 to get her taxes prepared for free. MEDA’s tax team corrected an issue from the past, getting Karina a $2,000 tax refund … but there was more work to do. It seems Karina had credit accounts in collections, rent that had tripled in the local housing crisis, and a son in elementary school with special educational and health needs. The Mission resident was given free one-on-one coaching, opening a Secured Credit Card to rebuild her credit score, sticking to a budget and now having saved thousands, and opening a Kindergarten to College savings account for her son, Chuy. The catalyst for this bettering of her life was simple: she came to a VITA site to get her taxes prepared for free and was made aware of the EITC for which she qualified. Family economic success is now on the horizon for this Mission Promise Neighborhood family. State Treasurer John Chiang knows firsthand the power of savings. Not only was he once a tax law specialist with the IRS, but Chiang explained to the audience today that his father managed to save a few dollars each week, despite the family’s budget being tight. Chiang saw that money grow exponentially over the years, and he now wants other families to harness the power of savings – especially via California’s EITC — to make that occur in their household. Chiang was adamant that leadership must be responsive to make this happen. Speaking on behalf of State Controller Betty Yee, Director of External Affairs John Kessler (photo, right) told of Yee’s strong belief that the state EITC is a game changer, especially as a complement to VITA sites with volunteers well versed in the needs of the low-income community. To showcase how their “Earn It! Keep It! Save It!” program is creating family economic success in the region and throughout the state at 200 sites, United Way of the Bay Area Chief Operating Officer Eric McDonnell explained that communities need anchor institutions. 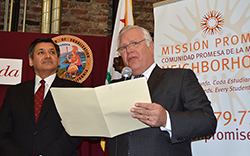 McDonnell noted that MEDA’s Plaza Adelante serves as such an anchor institution for San Francisco’s Mission District, thereby ensuring that families have access to all of the services and tools they need to achieve economic stability. Today’s press conference was a vital step in getting out the word that the California EITC is an important means of fostering fiscal stability for low-income and working-class families. This subject’s importance was indicated by the fact that so many pivotal players in this arena came together today to put forth a unified message. “It takes a partnership. One voice,” summed up Ma. Are you a Mission Promise Neighborhood family ready to get all of your EITC tax credits? Call (415) 282-3334 ext. 178 for your appointment for free tax prep in San Francisco. Special thanks to the City and County of San Francisco-Human Services Agency, United Way of the Bay Area and Bank of the West for helping low-income Mission Promise Neighborhood families do their taxes at no cost.